Instant downloads of all 946 LitChart PDFs (including Girl in Translation). After a drive in which eleven-year-old Kim searched futilely for skyscrapers and the Liberty Goddess, Aunt Paula and Uncle Bob park the car in a run-down, dirty neighborhood. Everyone gets out of the car. Uncle Bob unloads Kim and Ma's suitcases and Ma's violin case and stacks them in front of a boarded-up storefront. Aunt Paula seems embarrassed as she explains that she hasn't had a chance to inspect the apartment yet, but she'll fix anything wrong with it promptly. She offers Ma a box with sheets, an alarm clock, and a small television in it, and then she and Bob leave for the factory. For Kim, New York City means skyscrapers, the Statue of Liberty, and a great deal of hope. The street where Uncle Bob and Aunt Paula leave them suggests that she's not going to see much of the New York she hoped to. When Aunt Paula seems embarrassed, it suggests that she knows there's something wrong with the apartment and is aware she's doing something awful to Ma and Kim. Ma unlocks the front door to reveal a dark and cavernous hallway. She instructs Kim to stay downstairs while she makes her way upstairs, wielding the broom, to make sure it's safe. After a few minutes, Ma calls for Kim. As soon as Kim enters the apartment, Ma tells her not to touch anything—the apartment is filthy, and the windows are either cracked or missing entire panes. Dead roaches litter the floor, and Kim catches sight of live ones out of the corner of her eye. Ma stops her from banging the broom handle on the floor to scare them, insisting it'll disturb the neighbors. Kim suspects there are no neighbors. Ma and Kim's fear and surprise indicate that they absolutely weren't expecting these kinds of living conditions. This suggests that they trusted Paula to do better by them, which in turn indicates that there's going to be some shift in the way that Ma, Paula, and Kim engage with each other and choose to trust each other. The fact that Paula can do this suggests that she has much more power than Ma does. Kim inspects the bedroom; there's nothing there but a stained mattress, a flaking dresser, and a wobbly coffee table. Kim realizes that Aunt Paula lied: it's clear nobody has lived in the apartment for a while. Kim believes that Paula let them move on a weekday so that she had an excuse to leave while Kim and Ma were still thanking her for her help. Ma reassures Kim, but Kim believes that Ma must also feel betrayed by her older sister. The fact that Kim is able to make these connections suggests that in some ways, she's already becoming less Chinese—later, Ma will reprimand Kim for saying things like this out loud, as doing such a thing isn't befitting of a polite Chinese girl. Kim is already becoming Americanized. Stepping back, Kim explains that she and Ma spent their first week in the U.S. in Aunt Paula's house on Staten Island. Kim met her Uncle Bob for the first time and realized that though he's a rich man, he married Paula so he'd have someone to take care of him: he has a limp and uses a cane. Kim met her cousin Nelson and as the children greeted each other, they each whispered insults in the other's ear. The plan was for Ma and Kim to live with Paula and Bob so that Ma could care for Nelson and Godfrey, Paula's three-year-old. Paula had shown off her house and made special note of her fine white tea, insisting that Ma and Kim drink as much as they'd like. Nelson's nastiness here can be seen as a reflection of his mother and therefore suggests that Paula isn't at all the generous sister she pretends to be. The fact that he speaks Chinese still (he was born in the U.S.) shows that Chinese culture and keeping those cultural traditions alive is very important to the Chinese immigrants of the novel. The next day, Ma and Kim woke alone in the house. Kim suggested they try the special white tea, though Ma gestured to the old teapot and an inexpensive box of green tea on the counter. Ma told Kim that Aunt Paula left the cheap tea out on purpose; the special tea was never truly meant for them. She reminded Kim that they owe Aunt Paula and Uncle Bob a great debt for bringing them to the U.S. Kim explains that then, it was difficult for anyone to get out of Hong Kong unless they were female and married a rich Chinese-American man, as Paula had done. When Ma brings up that she and Kim owe Paula a great debt and thus shouldn't push back on her nastiness, it suggests that Ma will be willing to put up with all manner of abuse in the name of repaying her debts. Notably, she conceptualizes the idea of repaying one's debts as something uniquely Chinese, which shows how Ma's identification as Chinese will later trap her in an abusive situation. Aunt Paula returned around lunchtime, sat with Ma and Kim at the table, and complimented Kim's intelligence. Ma politely played down Kim's intelligence and asked when she should begin Nelson's Chinese lessons, which made Aunt Paula hesitate. Aunt Paula carefully said that Ma's services were no longer needed, and implied that this was because Ma had contracted tuberculosis the year before. Aunt Paula explained that she fired someone to create a job for Ma as a finisher at the clothing factory, which she insisted was a huge favor. Ma promised to work hard. Ma and Kim spent the rest of the week watching television. Kim felt as though she missed Pa, even though she doesn't remember him. The fact that Paula is open about firing someone to create this job for Ma casts her in a sinister light already, as it suggests that she doesn't view her workers' lives as valuable or worth much consideration or respect. This raises the question of whether Paula will actually value Ma and Kim's lives—and her decision to install them in their horrible apartment answers with a resounding no. Ma's promise to work hard again shows that she's willing to take the abuse in order to repay her debts. Back in the present, Ma and Kim spend days cleaning their apartment. On the second day they go to the grocery store to buy some ice cream as a reward for their hard work. However, the shopkeeper charges them three times as much as the price listed, and the ice cream is disappointingly thin and sour. Kim and Ma walk home quickly with their heads down. As they pass an old black man sunning himself in front of his shop, the man leaps up, assumes a martial arts pose, and shouts "hi-yah," terrifying Ma and Kim. The man laughs, explains he loves kung fu, and introduces himself as Mr. Al. When he realizes that Ma and Kim are Chinese, he asks what he can call a customer who he describes as a whale. Kim teaches him the Chinese word for "whale." Ma giggles and wishes him good fortune. Mr. Al smiles and thanks Ma and Kim. After the horrors of the infested apartment and the racist shopkeeper, Mr. Al is a breath of fresh air. While his interest in Chinese and kung fu isn't exactly culturally sensitive, he's the first person to not treat Ma and Kim as though they're nasty or a burden. This suggests that there are people around who are willing to help Ma and Kim, if only they can find them and attempt to build relationships with them. It's also worth noting that Mr. Al is likely aware that their apartment is in poor condition, so they don't have to hide their poverty from him. The roaches prove impossible to exterminate or get used to. Kim misses their neat apartment in Hong Kong, especially Ma's piano. In the Brooklyn apartment, Ma kills roaches while Kim protects Ma from the rats and mice. Though they attempt to use mousetraps, Kim is too squeamish to empty and reuse them, so they soon give up. They put the Tong Sing, the Chinese almanac, at the head of their mattress in the hope that it will help keep thieves and evil spirits away. Once the apartment is clean enough, Kim and Ma set up five altars, leave offerings for the gods and goddesses, and ask for protection. Ma owning a piano in Hong Kong is a symbol of their relative economic success there; this casts her violin, which she brought with her to the U.S., as a symbol of her poverty. Their actions of praying to the Chinese deities and setting up the altars shows that Ma and Kim are still very entrenched in their Chinese customs. As time goes on, Kim in particular will walk a fine line between being Chinese and being American. The night before Kim starts school, Ma says that she needs Kim to come to the factory with her after school every day to help. Kim agrees immediately, but Ma looks ready to cry. She says ominously that she's been to the factory. She hugs Kim and says that their future in the U.S. is the only one forward, though Kim thinks she's saying this mostly for her own benefit. Ma tucks Kim into bed, wrapping her in coats and one thin blanket, and promises to speak to Aunt Paula about the state of their apartment. Then she pulls out her violin and plays a Chinese lullaby. Kim's immediate willingness to help Ma is indicative of their strong relationship and Kim's desire to help smooth their transition in any way possible. Ma's response, on the other hand, suggests that the factory is no place for a child, and that she understands the sacrifice she's asking Kim to make by requiring her to work there—but Ma feels she has no other choice. Brock, Zoë. 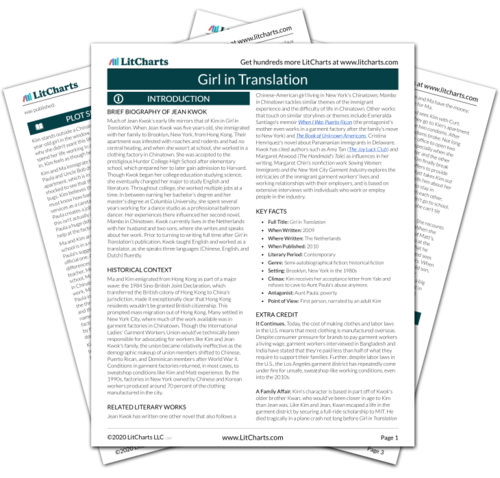 "Girl in Translation One." LitCharts. LitCharts LLC, 23 Oct 2018. Web. 11 Dec 2018. Brock, Zoë. "Girl in Translation One." LitCharts LLC, October 23, 2018. Retrieved December 11, 2018. https://www.litcharts.com/lit/girl-in-translation/one.